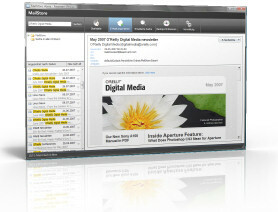 MailStore Home is THE single-user desktop solution for email archiving and backup. It keeps all your valuable e-mail messages in one persistent and safe place. Lightning-fast search, one-click backup, powerful export – all information from your email is at your fingertips any time. Burn your backup on a CD/DVD and never lose important email again! With MailStore Home, you can keep a virtually unlimited number of e-mail messages and attachments in one persistent and safe archive. To conserve disk space, MailStore Home saves only a single instance of each attachment, even if it appeared in more than one e-mail. Additionally, a smart compression algorithm is applied. You can search your e-mail within fractions of a second (including the contents of attachments), and limit the search result via Extended Search. With just a single click, all archived emails can be backed up to CDs or DVDs. A burning software is already integrated. You can preview the archived e-mail messages directly in MailStore Home, and reopen them in your favourite e-mail client (e.g. Microsoft Outlook) if needed. Messages are stored MIME-compatible, and can be recovered at any time without information loss. Download and try MailStore Home (13.4MB) yourself, or if you are using Microsoft Outlook Express you could also try my manual Outlook Express backup approach.